Encouraged by my progress I have decided to stick with my two handwork pieces for another couple of days - I won't see anything finished but I'll be a lot nearer an end. I've been adding little patches to the denim and filling in the gaps with stitching. This photo gives a better idea of its size. 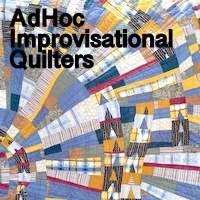 Also, I forgot to flag it up at the beginning of the week but there is still time to link up with AHIQ to share your improv, if you haven't already. How interesting! Visiting from Let's Bee Social. Wow! Love the handstitching on the denim. I've only done small amounts on denim so I truly admire the size of your project. Beautiful! Good use of stitches and color against the denim. I love your denim piece! It just keeps getting better and better! It is really coming along, I know you will love this when you are done. Very interesting progress. I have been doing some improve pieces and have enjoyed it so much. I have always leaned that way and have done some in the past but this time I used colors that I normally do not and have enjoyed the progression. Thank you for the improve posts this past few weeks. I realize I've never asked. How is hand stitching on the denim working? Size needle, length of thread before it breaks (does it break after pulling through a while?) Do you have trouble working the needle through the heavy denim?